Hey everyone. Where does the time go? I have been back in Brasil now for almost a month now but I lost my creative mojo dealing with everyday life stuff. But my creative mojo seems to be coming back with this card. It formed because of two things - my friend Elaine's birthday party this past Saturday for which I had to make a card, and THIS post on my friend Justin's blog. When I saw the "sketch" on his blog for Pals Paper Arts, I immediately thought of this card and made it, not just to enter into the Sketch Challenge, but to also give to Elaine. When I gave it to her, she almost cried. She thought it was the best birthday gift ever and she showed it to everyone. LOL. I hope you enjoy it as much as she did. This card is for this week’s Pals Paper Arts sketch challenge - PPA269! I have to be honest...I am really bad with matching colors - so I was very happy when I found this piece of double sided paper where each side worked perfect with the other (sorry, paper is so old I have no idea who made it). I started with a top folding card base of 4.25" x 11", scored at 5.5". Then I cut a piece from the darker pink side of the scrapbook paper, 4.25" x 5.25", and adhered to card base. Then I cut a piece from the other side of the paper, 3" x 5.25", and making sure to keep the bird in the piece. I used the curved half circle die from the Custom Panels Die Set and cut the paper. 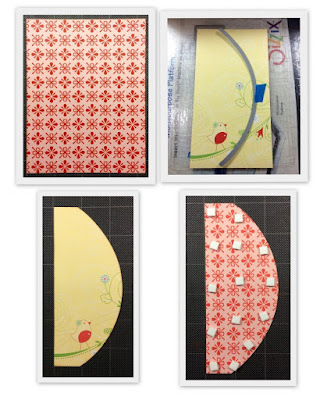 Turn over and apply some pop dots and adhere to the left side of the card front. Then I stamped a solid circle stamp on white cardstock, 5 times, using Rose Madder Archival Ink. 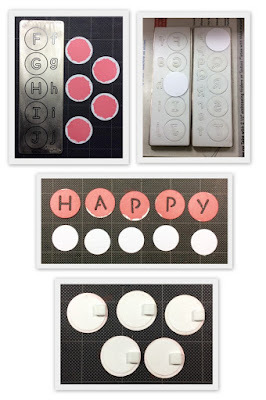 Cut each of the circles out with a 1 1/4" circle punch, then placed them face down onto each of the letters from the Baby Face die set and cut out the letters H-A-P-P-Y. Then I used a 7/8" circle punch and cut out 5 circles from white cardstock and adhered them to the back of each of the letters - so that white would show through each letter. Applied a pop dot to the back of each letter, on the right side, some glue to the left side and adhered the letters down the half circle to spell the word HAPPY. 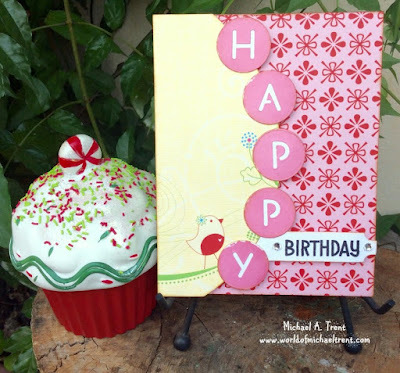 Finally, I cut the label die part from the Custom Panels Avery Elle set with white cardstock and stamped the word "birthday" from the Year Two set by Lawn Fawn. Adhered this to the card front and then stamped the word Celebrate on the inside of the card. Well, hope you liked this card. Nice to be back blogging!! White cardstock for card base - 4.25" x 11", scored at 5.5". Top fold.